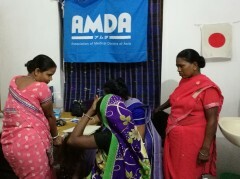 Since 2009, AMDA Peace Clinic in Bodhgaya (APC) has been providing various community health services and social development assistance to the people in Bodhgaya in the state of Bihar, India. APC had initially provided Ayurvedic treatment as its main service. However, as needs among expectant mothers had been increasing in the locality, the clinic shifted its focus on maternal healthcare in 2014. APC has been working on a home-visit program with two of its staff including one local nurse stationed at the clinic. The team visits homes of expectant mothers for monitoring in the target locations. It does take quite a bit of effort to go around each house under the scorching sun, however, the regular visit has been essential in deepening the ties and fostering mutual trust with the mothers-to-be. Thanks to this bond, APC has been their trustworthy medical consultant which they can truly rely on. APC’s nurse would always get a call whenever something happens to the unborn child or to the expectant mothers themselves. During the home-visit, the team handles a wide range of things such as health consultation and guidance for expectant mothers, immunization-schedule check for infants, pre-registration for the next prenatal checkup to name a few. Thanks to the assistance of local gynecologist and phlebotomist, the bimonthly checkup has been attended by about 20 to 30 expectant mothers every time. A blood test is offered to those who need it as well. The fee for the checkup is 20 rupees which includes subscription of medicine by the doctor in charge. (The below video clip is from the prenatal checkup held on 08 September 2017). At APC, the clinic organizes a health education class that also provides the participants with nutritional meals. The meals are prepared with healthy ingredients that do not cost much and are easy to obtain. In addition, the program has recently started to offer complementary nutritional supply as well. At a class held on 05 September, 17 participants were given guidance on Moringa, a plant known for its high nutritional value. According to the Food and Agriculture Organization of the United Nations (FAO), Moringa consists of rich protein, vitamin A, vitamin B, vitamin C and minerals. The plant is highly recommended to children and pregnant women for better diet. In Bodhgaya, Moringa leaves, fruits and stems are eaten around the year as a common vegetable. It is also inexpensive and easy to find. After the class, APC provided Moringa soup along with bread, fig and apple to the participants. When asked what she learned from the lecture, a participant said the plant indeed carries a lot of vitamins and nutrients that are requisite for women expecting a child. It is often not so easy to convey knowledge by word of mouth, but by persistently holding a lecture as such, they would start to learn things more solidly. AMDA will continue to serve the people in the locality with the aim of stabilizing the health knowledge in the entire community.